Storms don’t diminish NY13’s ‘Revelation of Hope’ opening. Sponsored by the Seventh-day Adventist Church, the meeting is one of hundreds being held in metropolitan area during June as part of the denomination’s “Mission to the Cities” campaign. Already, officials of the Atlantic Union and the two area conferences say 1,100 people have been baptized as Seventh-day Adventists during the months leading up to the event. The NY13 campaign – which features 160 different evangelistic events across the region in June alone – is expected to culminate June 29 at the Nassau Coliseum with a rally attended by more than 15,000 people. The overall effort includes the participation of the Atlantic and Columbia Unions, as well as the Southern New England, Greater New York, Northeast and New Jersey Conferences. In recognition of the event, New York City’s public advocate, Bill De Blasio, sent his assistant Warren Gardiner to attend the opening meeting. 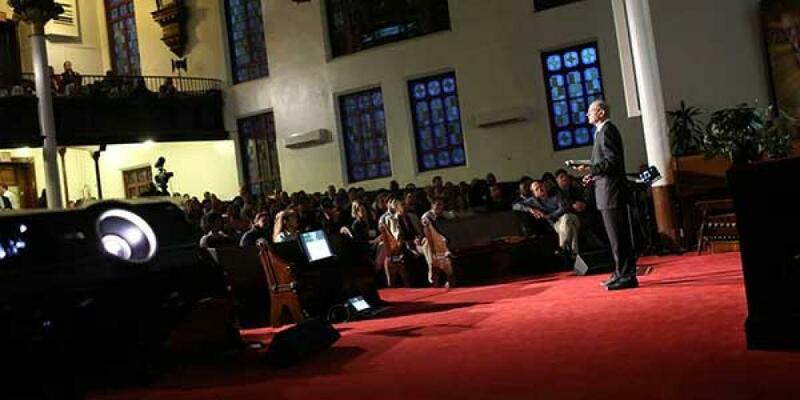 Other public officials are expected to attend related NY13 events, said James Richmond, a community liaison for the Church’s Greater New York Conference. Inside the 132-year-old church building, more than 500 people gathered in what master of ceremonies Mark Finley called an “oasis of peace” to hear a message which stretched beyond today’s storms. Visitor David Tan, who called himself “a Singaporean retired and living in Thailand,” said Wilson’s message was a “good and clear” introduction to the book of Revelation.